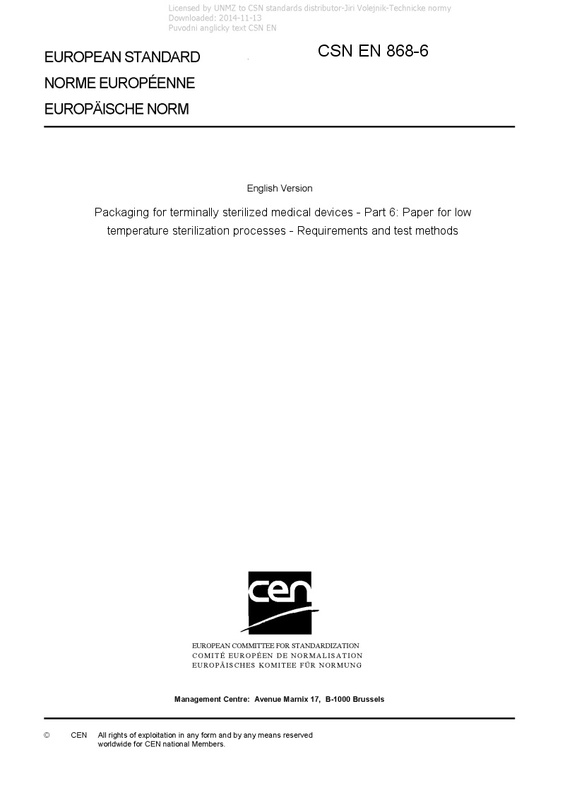 EN 868-6 Packaging for terminally sterilized medical devices - Part 6: Paper for low temperature sterilization processes - Requirements and test methods - This draft European Standard provides test methods and values for paper used in the manufacture of preformed sterile barrier systems and/or packaging systems that are intended to maintain sterility of terminally sterilized medical devices to the point of use. The need for a protective packaging may be determined by the manufacturer and the user. This part of EN 868 only introduces performance requirements and test methods that are specific to the products covered by this part of EN 868 but does not add or modify the general requirements specified in EN ISO 11607-1. As such, the particular requirements in 4.2 to 4.3 can be used to demonstrate compliance with one or more but not all of the requirements of EN ISO 11607-1. Paper specified in this part of the series EN 868 is intended for use in part or complete manufacture of pouches and form and fill packs and lidding material for packs. NOTE 1 The paper specified in this part of the EN 868 series is suitable for the manufacture of sterile barrier systems to be used in ethylene oxide, irradiation or low temperature steam formaldehyde sterilization processes and to produce coated paper according to EN 868-7. NOTE 2 Paper according to EN 868-3 can also be used for these sterilization processes. The materials specified in this part of EN 868 are intended for single use only. When additional materials are used inside the sterile barrier system in order to ease the organization, drying or aseptic presentation (e.g. inner wrap, container filters, indicators, packing lists, mats, instrument organizer sets, tray liners or an additional envelope around the medical device) then other requirements, including the determination of the acceptability of these materials during validation activities, may apply.